Senior and rookie cyclist for Kappa Alpha Theta Brenna McGinn edged Teter Cycling’s Emma Caughlin to capture the 2014 women’s Little 500 title. Rookie Little 500 team Northern Indiana Cycling has overcome challenges, unexpected obstacles to fight its way to Saturday's race. Black Key Bulls Cycling and Teter Cycling took the Team Pursuit crown and captured the Spring Series Sunday in Bill Armstrong Stadium. Just two years ago, the IU women’s basketball team finished the season with only six wins. Freshman Alexis Gassion had a crucial rebound and pair of free throws to help IU women's basketball advance in the WNIT. IU women's basketball defeated Belmont 48-47 on Thursday to advance to the second round of the Women's National Invitation Tournament (WNIT). 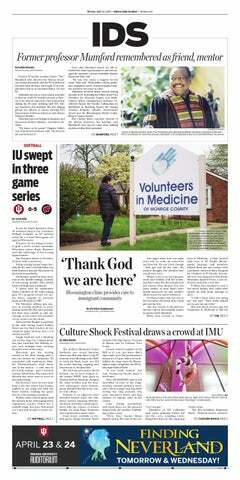 For the second consecutive year, IU faced Michigan in the first round of the Big Ten Tournament. “It’s a tough matchup, but we’re both in second-year programs of trying to rebuild,” IU Coach Curt Miller said. “And so there’s a little bit of bragging rights in this game.”Michigan’s rebuilding process started after losing six seniors to graduation at the end of last season. IU was completely outmuscled in its 76-56 loss to No. 21 Michigan State. The Spartans outrebounded the Hoosiers 46-33, tied for the fifth-most rebounds by an IU opponent all season. Freshman center Amanda Zahui B. scored 26 points and grabbed 19 rebounds, leading Minnesota to a 73-62 win over IU. The IU women’s basketball team’s 79-61 victory against Illinois Saturday put it closer to a postseason berth. With two road games remaining, the Hoosiers can improve their RPI and increase their chances of getting an invitation to a postseason tournament. IU (17-9, 4-9) will face Illinois (9-17, 2-11) for the second and final time in the regular season at 3:30 p.m. Saturday for senior night. The Hoosiers will have two days to prepare for the their final home game against the Illini. IU women's basketball led by as many as eight but squandered a lead against No. 21 Penn State. The Hoosiers lost 76-61. When IU faces Nebraska Sunday, it will be the team’s fifth game against a ranked opponent this season. IU will face Penn State for the second time in the regular season when it plays host to the Nittany Lions Thursday at 7 p.m. in Assembly Hall. Led by freshman guard Larryn Brooks’ 22 points, IU showed toughness and resiliency in a 76-69 victory against Wisconsin. When IU lost at Wisconsin earlier in the season, freshman guard Alexis Gassion said it was a game the Hoosiers let slip away. When IU Coach Curt Miller came calling and expressed interest in her, it was hard for freshman guard Larryn Brooks to say no. Facing another team from Illinois, there would be no shooting struggles from the field this time for the IU women’s basketball team. After suffering one of its poorest shooting performances of the season last Thursday against Northwestern, IU had one of its best days from the field in a 77-58 win yesterday at Illinois. So close, yet so far. For the IU women’s basketball team, 14 missed free throws was the difference in a 58-52 loss to Northwestern. FINAL: IU 76, Wisconsin 69.